KATHMANDU, March 11: The 744 local units delineated under the new federal setup have come into effect from Friday, said Deputy Prime Minister and Minister for Federal Affairs and Local Development, Kamal Thapa. 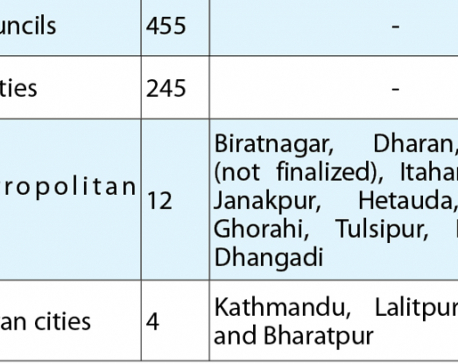 As the ministry published the details of the 744 units in Nepal Gazette on Friday, the new local structures have come into effect, replacing the erstwhile 217 municipalities and 3,117 village development committees. “The new 744 local units under the federal setup have come into effect across the country from today (Friday),” said DPM Thapa while unveiling the Nepal Gazette which includes the information on the new local units. During a program organized at the ministry at Singha Durbar, DPM Thapa thanked the local level restructuring commission (LLRC) for working day and night for preparing the units and their boundaries. The local administration of the municipal and village councils will come in operation from Monday, technically. Thapa said that the steps will further ensure the local election scheduled for May 14. Kedar Bahadur Adhikari, secretary at the ministry, informed Republica that most of the erstwhile local bodies changed their names as per the new federal structure on Friday as they had been issued a circular on Thursday to change their names. “The new offices for the 744 local units are almost ready and the bodies will come into operation to provide their services to locals from Monday,” Adhikari told Republica. He said that manpower from the existing bodies will be mobilized in the new metropolis, sub-metropolis, municipalities and village councils across the country. He further said that the staffers in the existing local bodies will be mobilized in the new units in the same area. “For now, we don't have any shortage of manpower for the new structures. But we have demanded at least 400 new staffers for running the local units as chief and executive officer with the Ministry of General Administration,” Adhikari added. The government on Wednesday had decided to provide at least Rs 10 million to each of the 744 local units delineated under the new federal setup to bring the local administration in operation.